Martini's And Manicures: Blake Lively’s Nails Actually Had A Hidden Message! The former Gossip Girl superstar, Blake Lively is a huge fan of manicures. She's always got her manicure on point. 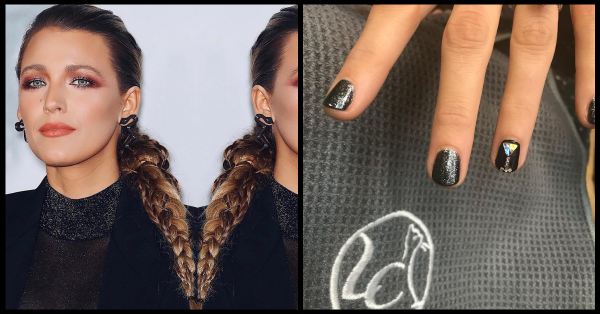 At the premiere of her upcoming movie, A Simple Favour, Blake rocked a shimmering Givenchy pantsuit with a manicure to match it! Her nails were painted a shimmering black reminiscent of a night sky. What you probably didn't notice was that her mani actually had a hidden message. Her celebrity manicurist, Elle is responsible for all of Blake's gorgeous nail art. For the premier, Elle recreated a tiny martini glass on one finger encrusted with Swarovski crystals. The martini glass is supposedly symbolic of Blake's role in her A Simple Favour. If you watch the trailer, you'd see her character Emily's serious commitment to drinking martinis while looking absolutely fabulous! Well, we'll just have to wait for the movie to know more! I can't help but leave you with a few more times Blake Lively's nails had my heart.